It is the middle of May and therefore smack in the middle of spring as I write this, but it feels much more like winter with a howling gale and sheeting rain. So I’m in the mood for warming food. Both the cooking method and the ingredients I’ve chosen will help me feel warmer, as the slow cooking will fill the house with enticing smells, and the warmth of the spices will warm me from the inside when I have my dinner, without overheating my mouth. The vegetables in this recipe are not particularly specific to any one season, but are available pretty much year round, and the limited range means that it won’t break the bank to gather them together. 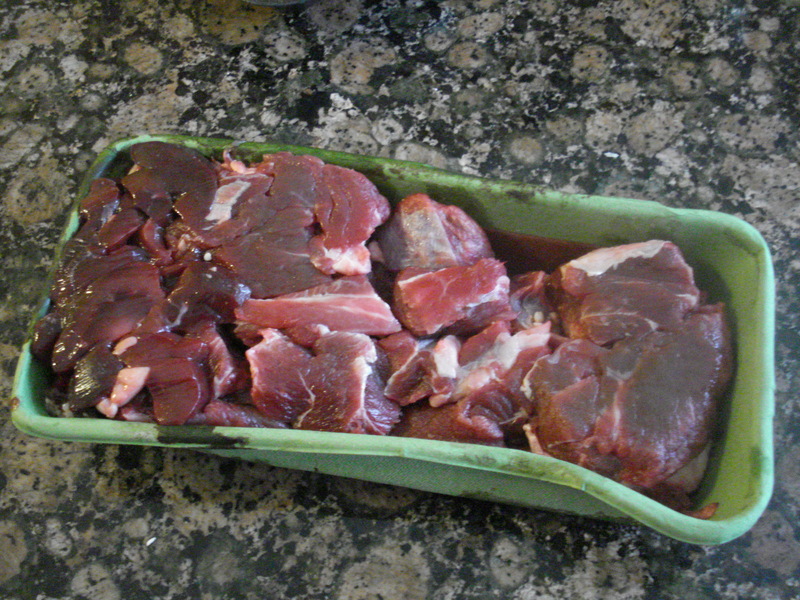 I purchase stewing meat in bulk deals on a regular basis (from the farmers’ market) and freeze it for days just like this. This is an easy meal to prepare, with less than half an hour of active preparation, followed by 4-5 hours anticipation while it gently cooks unattended. Chop carrot and mushrooms roughly. Mince the chilli pepper, seeds and all. Heat 1 teaspoon oil in non-stick frying pan (to aid colouring the vegetables). Lightly saute veg, just until a little coloured. Bruise cumin seed in mortar & pestle. Add 2 tsp oil and the cumin seed to frying pan. Fry until it sizzles. Add flour, stir to incorporate. Don’t skimp on the tahini! When well combined, gradually add stock. but once well blended it is lovely. Cook on low for 4-5 hours, until meat is fork tender. Serve with rice or potatoes and a green vegetable on the side.